If you have never been to the Salvador Dali Museum, then it is time to get over there. The museum is filled with this avart garde artist's works. Located in downtown St Petersburg, Florida, the museum probably will receive even more visitors in the near future since a new film on him is set to open worldwide in 2009 (See the previous posting, "Is Salvador Dali Gay?"). Perhaps the curators of this museum will not welcome the obvious, controversial question, but no doubt they will welcome the higher traffic of visitors. See HERE for more information on this museum's location, opening hours, and exhibits. 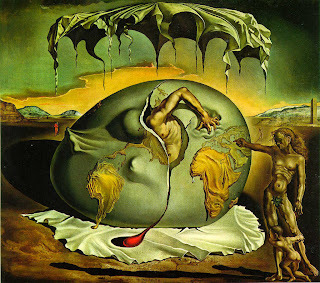 Below, to get a taste of Dali's artistry, is a review of the above featured painting, Geopoliticus Child Watching the Birth of the New Man (1943), that you can see in this same museum. The review was written by Randy Rose, a talented, promising student of mine. Salvador Dali was an artist who was not limited to just one particular style. The body of his work, from early impressionist paintings through his transitional surrealist works, and into his classical period, reveals a constantly growing and evolving artist. Dali is mostly known for his surrealist works, but one of my favorite pieces is from his classical period. Geopoliticus Child Watching the Birth of the New Man (1943) captivated me. It portrays the birth of "New Man" appearing out of America on the egg as the emerging world power. The man's left hand is crushing Europe, England in particular, whom America fought to gain its independence. New democracy and new enterprise are born. The enlarged pendulous depiction of South America and Africa represents perhaps the growing role of the Third World. The mother figure (perhaps androgynous) is disdainfully pointing at the emerging man to the child apprehensively cowered at her feet, as if to say, "Look what's happening! What are you going to do about it?" I see the child as a symbol of the "new colonies" and the man cracking through the earth is our future generations heralding the damage to come. The promise of the modern man, with all the good intentions he had in the beginnings, is now in jeopardy. Such an idea is conveyed by the shadowed veil that looms over the whole scene and in the "violence" of the birth, which seems set to tear apart the physical earth. The child is the crucial element in the situation. The child is casting a far longer shadow than the mature mother and this signifies the repercussions the New Man will feel on this planet for a greater period. It is up to the child to move and channel the course of our future in the right direction, making this world a better place. This painting suggests to me that eerie feeling of peering into the future. It is a vision of what will become of our fragile planet and the harm brought to it by modern man. Geopolitucs is one of my favorites as it posits such large concepts and yet does it in a thoughtful manner. The colors and the flow of this painting first attracted me to it and once I had learned its symbolism, it has encouraged me to leave a shallower print on this planet.